While I have done everything to include all aspects of what to expect, and what goes on behind the scenes of an operational emergency shelter, it is impossible to cover each and every item. Things happen that cannot be expected to happen. So expect the unexpected. What I can tell you is if you are going to participate in an upcoming operation that is planned, the best thing I can tell you is rest well the night before if possible. Although I have never been able to do so, as I play every possible scenario through my mind. Eat a hearty breakfast or meal beforehand. Depending on the size of the operation, there may not be a lunch, and dinner may end up being very late. Dress comfortably; I prefer EMS or Tactical Pants with lots of Pockets, no shorts. Comfortable Socks and Shoes are a must. No Flip flops, or open toed shoes. Besides the fact that you will be on your feet for hours, things get dropped, including syringe needles when things are moving quickly. I again prefer a tactical boot. A long sleeve cotton tee may be more preferable to avoid scratches. Also you cannot be prepared for the things that you may see that will indeed upset you. Lean on each other your teammates. Talk, share but do not hold it in. Cry if you must. No one who is there is going to judge you. They are there to do the same job. If you have any empathy of animals in distress this will be where it will hit you. Things will get out of hand fast, and you may be working to operate without a lot of support in the beginning. I recommend a disaster kit that you can deploy yourself, to at least get started until help arrives or you can get to a shelter that is in operations. 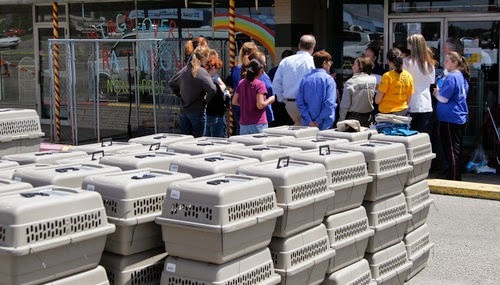 You may want to find out if there is a predetermined animal shelter in the event of a disaster in or around your local area. Contact your local Emergency Management Agency, and ask, they may ask you to come in and get signed up to become a disaster worker before you may be allowed to help. Again get the training under your belt that was written in the very first article. But again first and foremost be sure you and your family and companion animals come first in a disaster, you will be no good to anyone else if you have to worry about your own family. So Again Be Prepared for Anything, Adapt and Overcome.